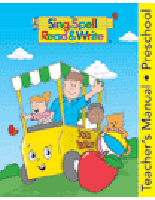 Sing, Spell, Read & Write helps children learn to read, write and spell through 36 carefully-sequenced steps and it addresses every child's learning style through a multisensory approach. The program is easy-to-use in any home setting and is comprehensive - providing you with all the tools you need at your fingertips! Children love learning through the program's phonics songs, games, and fun routines that use music to build lasting skills!